EAN 5060180390013. 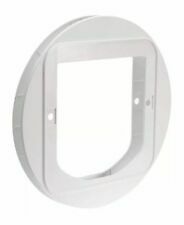 SUREFLAP Mounting Adapter for Cat Flap - White. Suitable for Wood, Glass and Brick. 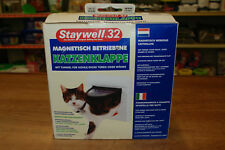 Staywell 32 Cat Flap. Magnetically operated cat flap with a tunnel for hollow or thick doors or walls. Cat friendly transparent flap. Studio: SureFlap. Model: Mounting Adaptor - White. CLOTHING |. Release Date: 16/07/2016. Orders will be fulfilled by our own warehouse or a 3rd party supplier at our discretion. Colour: White. We promise to do everything possible to put things right for you. Sureflap mounting Adaptor For glass fitting 210mm min 260mm max. 5 out of 5 stars - SureFlap Cat Flap Mounting Adaptor White - Suitable For Glass Doors, Walls etc. 10 product ratings10 product ratings - SureFlap Cat Flap Mounting Adaptor White - Suitable For Glass Doors, Walls etc. The Sureflap Mounting Adapter is for use with the Sureflap Microchip Cat Flap. You should purchase this as an addition should you be fitting your cat flap into glass or a wall. It is also useful if you are replacing your older cat flap with the Sureflap and your cut out is larger than the actual Sureflap, as you can use this adapter to cover the additional space providing a seal to prevent against draughts and moisture. The maximum diameter that this will cover is 260mm. Use for holes ranging from 210-260mm. The SureFlap Mounting Adaptor allows the SureFlap Cat flap and SureFlap Pet Door products to be installed inside glass and walls. We're a bit different, like your pet. Every pet has their own personality. SUREFLAP Mounting Adapter for Cat Flap BNIB EAN 5060180390013. Condition is New. Dispatched with Royal Mail 2nd Class. 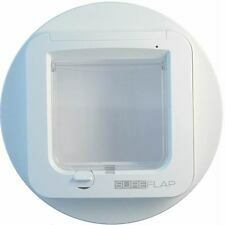 SureFlap Cat Flap Glass Mounting Adaptor - White. 5 out of 5 stars - SureFlap Cat Flap Glass Mounting Adaptor - White. 10 product ratings10 product ratings - SureFlap Cat Flap Glass Mounting Adaptor - White. SureFlap Cat Flap Mounting Adaptor, White. For use with the sureflap microchip cat flap or dualscan cat flap. Sureflap cat flap mounting adaptor. The sure flap mounting adaptor is useful when installing the sure flap microchip cat flap or dual scan cat flap into glass, walls and certain door types. Mr Pets UK Ltd, PO Box 7049, Darlaston, WS10 1DJ. The pet door is selective entry only – intruders are kept out but any animal can leave. 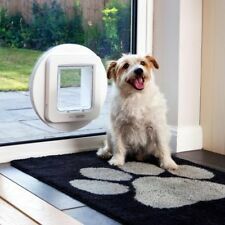 SureFlap Microchip Pet Door – give your pet freedom and security. The pet door uses your pets existing identification microchip as an electronic door key, unlocking only for them. This Microchip Pet Door give your pet freedom and security. The pet door uses your pets existing identification microchip as an electronic door key, unlocking only for them. 1 x Microchip Cat Flap. The pet door is selective entry only intruders are kept out but any animal can leave. For use with the sureflap microchip cat flap or dualscan cat flap. The sure flap mounting adaptor is useful when installing the sure flap microchip cat flap or dual scan cat flap into glass, walls and certain door types. The mounting adapter from SureFlap ensures a perfect connection of the [purl=2955]Cat Flap[/purl] to the glass or the wall that it is attached to. The Mounting Adapter from SureFlap is suitable for mounting on. Sure flap cat flap mounting adaptor. For use with the sure flap microchip cat flap or dual scan cat flap. images shown are for illustration purposes only and are not always accurate in relation to the product received.